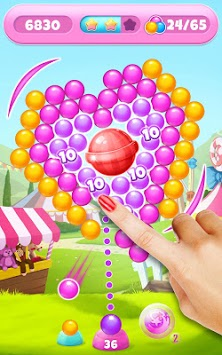 Blast bubbles & beat tons of fun sugary levels! Play offline without WiFi! Candy Spinner is a challenging bubble spinner game. 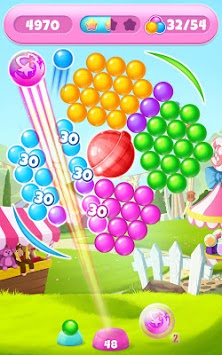 Match balls, clear sugary levels, and enjoy the relaxing fun bubble pop game. Every time you shoot, the board is spinning and makes it challenging in every move you take. Indulge yourself with free offline puzzles and quests. It is super addictive, hours of fun are guaranteed! Candy Spinner is an easy offline game to play, but challenging to master. We dare you to beat this sweet adventure! - Aim the shooter at the balls you want to pop. - When you’re ready, shoot! - Match at least 3 bubbles to watch them explode! - Matching more than 3 balls will create major explosions! - As you start blasting through balls, the entire board starts to spin and whirl. - Because Candy Spinner is a physics-based game, you can take advantage of chain reactions to pop more bubbles, crush touching balloons, and create bigger explosions! - Smash all bubbles in limited moves. Build your strategy carefully to make the best shots. - Blast more balls for popping good boosters that make every level more exciting. + New bubble shooter game with whirling mechanism that makes the whole board spin! + No WiFi game: Play offline, online, and anytime you’d like! + Super aim shooter: Shoot with this booster for perfect on target shots. + Easy fun! Candy Spinner is the perfect way to spend a day. + Free adventures: This no internet connection game is totally free! + Candy Spinner has hundreds of levels, tons of epic quests, and endless puzzles to challenge your brain! 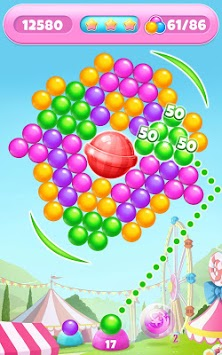 Get Candy Spinner on your Android or Tablet device, and start crushing bubbles! Download today a unique bubble shooter game, play in an offline mode and enjoy logic quests and puzzles!